Geothermal heating (also referred to as green heat, earth-coupled heat, earth connection, geoexchange, geothermal heat pumps [GHPs], ground-source heat pumps [GSHPs], and water-source heat pumps) is becoming an increasingly popular choice for heating and cooling – but it’s as old as the earth itself. In winter, warmth is drawn from the earth through a series of pipes, called a loop, installed beneath the ground. A water solution circulating through this piping loop carries the earth's natural warmth to a heat pump inside the home. The heat pump concentrates the earth's thermal energy and transfers it to air circulated through interior ductwork to fill every space in your home. In the summer, the process is reversed; heat is extracted from air inside the house and transferred to the biggest "heat sink" of all--Mother Earth--by way of the ground loop piping. The geothermal system also uses some of the heat extracted from the interior in the summer to provide free hot water. 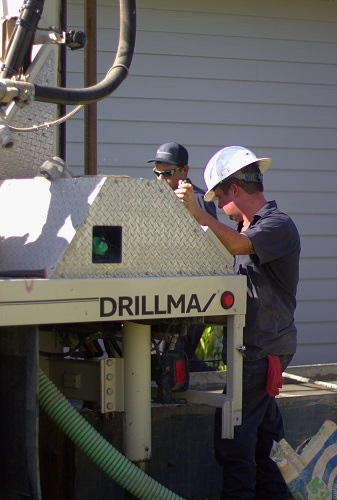 There are many reasons why geothermal is your best choice for home heating and cooling. Chief among them: MINIMAL ENVIRONMENTAL IMPACT. Geothermal systems significantly reduce our dependence on the earth’s finite supply of fossil fuels and help keep our blue skies blue. In addition, oil and gas systems require fuel for heating and a separate air conditioning system for cooling. Geothermal provides both in one system. Geothermal systems are the worlds most advanced and most cost-efficient heating, ventilating and air-conditioning (HVAC) systems. EPA has confirmed geothermal systems operate at 75% greater efficiency than oil furnaces, 48% greater efficiency than gas furnaces and 40% greater efficiency than air source heat pumps. Want FREE hot water? In the summer your hot water is heated by the excess heat extracted from your home from the cooling cycle providing virtually free hot water. We are an International Ground Source Heat Pump Association (IGSHPA) Accredited Installer and have the ability to offer the only qualified renewal energy system available today. These systems are perfect for homes, apartment complexes, businesses, schools, and more. In addition to heating and cooling, GSHPs also create free hot water in the summer and deliver substantial hot water savings in the winter.